Are you the crazy lady who cuts off her blooms and brings them inside? I am. 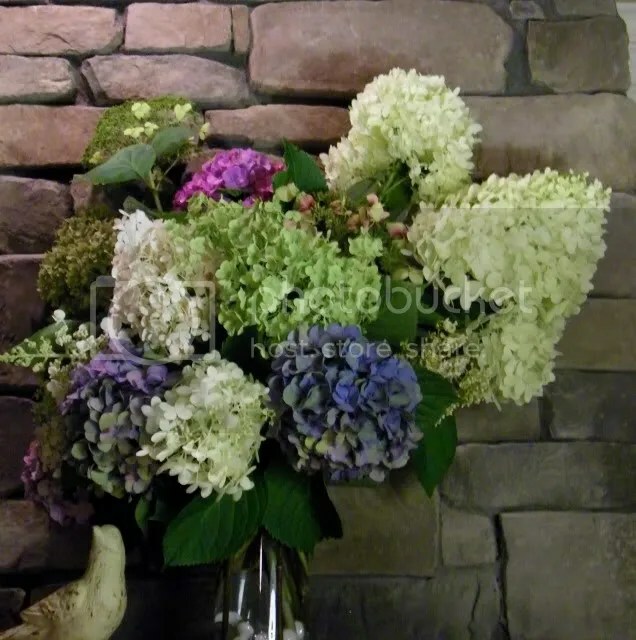 Most of my hydrangeas are represented in this Victorian bouquet. ‘Limelight’, ‘Let’s Dance’, ‘Incrediball’, tri-color, ‘White Dome’, ‘Little Lamb’, ‘Invincibelle Spirit’, ‘Pinky Winky’, and ‘Vanilla Strawberry’ fill the glass vase to overflowing. All are in different stages of bloom and color. The gorgeous lime puff ball in the center is the aging blooms of ‘Incrediball’. To the right are the huge conical bloom head of ‘Limelight’. The tallest is the end of season ‘White Dome’ that will add winter interest with its eventually beige character. Previous Post A porch makeover is coming at flowergardengirl’s house! those are some gorgeous hydrangeas Anna. I love your look of your blog. The header photo is spectacular.